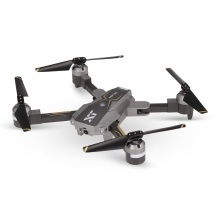 Attop X-Pack 8 is a super functional RC drone with outstanding appearance and folding design. Its high quality shell, reinforced and tough propeller, which make it incredibly strong. Altitude hold and optical flow positioning functions provide stable flight that will be good for aerial photography. 720P wide angle camera is ready to give the drone a full shot to reinvent your vision from a new prospective. Wifi FPV transmission system with phone APP control will give you a funny flying experience. Are you hesitating for what? Take this attractive drone home! Functions: Folding design, 720P wide angle camera, wifi transmission, up/down, forward/backward, turn left/right, take photo and video, optical flow positioning, altitude hold, app control, G-sensor, headless mode, 3D flips. Innovative selfie drone, 720P wide angle camera allows you to get great selfies effortlessly and take your selfie from a wider perspective. You can choose the 2.4GHz remote controller or Wifi APP on your phone to control the drone according your habits. Altitude hold and optical flow positioning functions provide stable flight, wonderful for aerial photography. With attractive headless mode, completely solving pilot loss-of-orientation problem. 3D flips with amazing agility and high/low speed switch mode provide stunt aerial show.